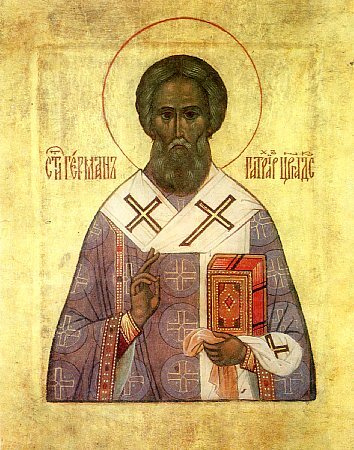 Sainted Germanos, Patriarch of Constantinople, was born at Constantinople in the VII Century. His father, one of the foremost senators in Byzantium, was killed by order of the emperor Constantine Pogonatos (668-685), and the boy Germanos was emasculated and given over to church clergy, where he deeply studied Holy Scripture. For his sanctity of life, Germanos was made bishop in the city of Kizikum. Saint Germanos rose up steadfastly in defense of the Orthodox faith against the iconoclast heretics. He was later made patriarch of Constantinople. Saint Germanos continued to stand up against the iconoclasts and to their spokesman, the emperor-heretic Leo III the Isaurian (717-741). But the contest was unequal, and he was forced to put his omophor upon the prestol' (altar-table) in the altar, and to resign the archpastoral cathedra. Then the enraged emperor, – having accused the Patriarch the day before of heresy, sent soldiers, who subjected the saint to beatings and threw him out of the patriarchal residence. Saint Germanos was Patriarch for 14 years and 5 months. He settled into a monastery, where he spent the remaining days of his life. Holy Patriarch Germanos died in the year 740, at age 95, and was buried in the Khoron monastery in Constantinople. Afterwards his relics were transferred to France. At the Seventh OEcumenical Council (787), the name of Patriarch Germanos was written into the diptych-list of the saints. Written by him was: "Meditation on church matters or Commentary on the liturgy"; also a composition, devoted to an explanation of difficult places of Holy Scripture, and another work concerning the rewards of the righteous after death. Providing a wealth of historical accounts is his important work about the various heresies that had arisen since apostolic times, and also about the church councils taking place during the reign of the emperor Leo the Iconoclast. There are preserved also three missives from the Patriarch about the veneration of icons, which were read at the Seventh OEcumenical Council. His other works present his hymns in praise of the saints, discourses on the feasts of the Entry into the Temple, the annunciation and the Uspenie (Repose) of the MostHoly Mother of God, and on the restoration of the church in honour of the Placing of the Venerable Belt (Poyas, Zona) of the MostHoly Mother of God.